In Windows 10 you can customize taskbar buttons by changing buttons sizes, grouping of taskbar buttons by App and show or hide App labels on taskbar. Right click on taskbar and select "Properties" in context menu. 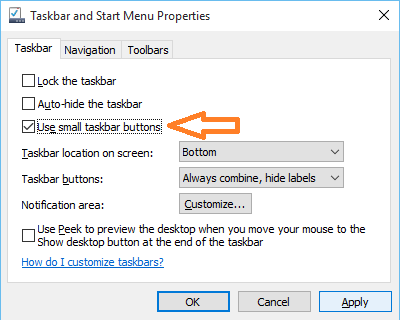 In "Taskbar and Start menu Properties" window, select check box in front of "Use small taskbar buttons" to make taskbar buttons appear smaller. You can uncheck this to revert taskbar buttons size to default bigger size. Click on Apply button to save the change. 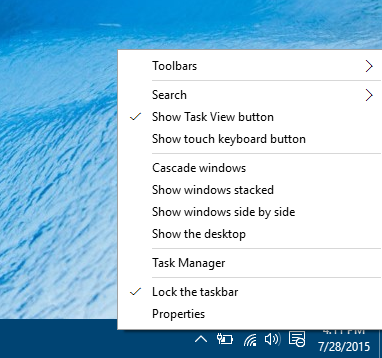 In "Taskbar and Start menu Properties" window, select one of below options in "Taskbar buttons" drop down list. Always combine, hide labels: always group (combine) taskbar buttons for same App, and hide App labels. Combine when taskbar is full: start grouping (combine) taskbar buttons for same App only when taskbar is full. 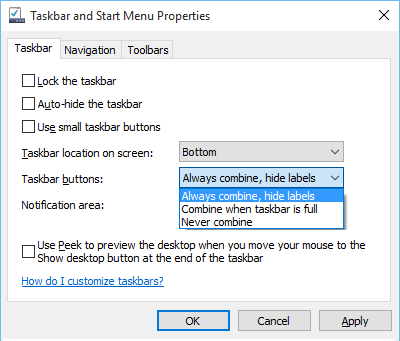 Never combine: use this option to always show different taskbar button for each window, and show App labels on taskbar buttons. Click on Apply button to save changes.